Christmas calls for a little black dress and multiple strands of our beloved pearls. Really? For what occasion is the LBD not on call? That’s neither here nor there. We’re talking Christmas. There’s church, parties, dinners, cocktails, office gatherings and more people than we can remember for one season, non? The LBD can be dressed up or down, stockinged or not, pearled or otherwise bedazzled, wrapped or bare armed, heeled or flat–except not in this house. Pfft. What brings us to LBDs and the holidays? Reading in the bath of course. Propped in the steam, I devour yet another tome regaling our lovely Coco Chanel and all things elegant, whilst eating bonbons. Well, actually Ghirardelli Squares but close enough. Did you know the LBD was a revenge dress? Doesn’t that make it even better? Seems our dear Coco had retired and shuffled off to Switzerland. Word echoed over the mountains that Mr. Dior was creating quite a stir. His new line, labeled by those in the know, “A New Look,” featured full flouncy skirts over tiny waists. You know the look–it defines early Dior. Yards of fabric for skirts topped with tight, bust enhancing, teeny-weeny waisted jackets. And a fab hat and some gloves. Why, oh why don’t we wear gloves and hats. No, not the warm and woolly kind. The sleek and lovely kind. Just once I’d like to turn up in fashionably tipped to one side millinery and cream leather gloves. But then I’d have to ask for a cigarette so there’s that. Back to Dior–the frenzy is created by such brazen use of fabric and detail after all the rationing of the war. Women lost their minds and a legend was born. 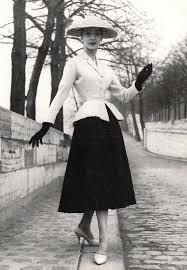 Except for our Miss Coco, who quipped, “Christian Dior doesn’t dress women, he upholsters them.” Mon Dieu Coco. 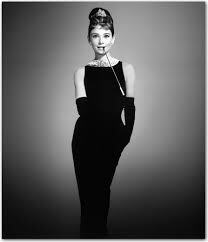 Her answer: the LBD, which swept across the pond faster than you can say “So there.” The dress lives in infamy since. Remember, her collections began with one simple thought. Get rid of the corset. At the very least we owe her our gratitude for that. Add the LBD and we are indebted to this girl ’til death due us part. She died years later, never retiring again, in her bed at The Ritz; where we all should die, champagne at the ready. She was, always, a staunch defender of women and style. The point of all her styles was comfort and freedom of movement. If I owned a Chanel tweed suit, I’m sure I wouldn’t race to change into my jammies after work. I’d probably start eating proper dinners, choosing a different dining room chair each night, enjoying an aperitif and the company of younger lovers. Ooh–too much channeling Coco dear. Need more? Avec plasir mes amis. Bottom line? Wear the LBD for the holidays. Up, down, pearls, bows, flounces. Please no flats. My head might spin round right after eating chocolates in the bathtub. Pfft.